What is the running-time and format of your DVDs? What is Qigong / Tai Chi? What distinguishes Tai Chi from other forms of exercise? Why is Tai Chi considered by some people to be the best form of exercise? Why should I order your Tai Chi DVDs as opposed to all the others? Do you have any other DVDs? Do you offer a Certification Program? Mark Johnson’s DVD programs are 60 minutes in length, divided in three segments: The first consists of a 20-minute warm-up everyone should do every day, followed by the second 20 minutes which continues with showing the 5-minute style shown from different angles, including front and back, and finally concludes with a 20-minute in-depth explanation on how to do the 5-minute style. The last segment does not have to be watched repeatedly, making it a 25-minute daily workout. “Qigong” (pronounced “Chee Gung” and sometimes spelled “Chi Kung”) is a Chinese term for many different of energy cultivations. “Qi” is any invisible, powerful energy. “Gong” is the result of practice and training, including power and control. Any energy cultivation that involves the coordination of your mind intent, breathing and postures (moving and still) is a “Qigong”. There are hundreds of kinds of Qigongs. There are two main classifications... “internal and external”. There are “soft” or “internal” styles for medical and health purposes, as well as "external" or "hard" styles for use as martial arts. Qigong has began in prehistoric China, and evolved as a medical practice, then as a spiritual practice, and then as a martial art. All started with simple movements and breathing techniques. Mark teaches a specific set of Qigong exercises called the 8 Treasures, a very powerful and sophisticated set of 32 moves that are used as a foundation for Tai Chi. The style of Tai Chi movement Qigong/Tai Chi is based upon the meridian system used in acupuncture and Chinese medical theory. Unlike most styles of Tai Chi, Qigong Tai Chi was founded by ancient Taoists, not grounded in Martial application. Why do 180 MILLION people worldwide practice Tai Chi every day? Why is Tai Chi so popular lately? Because people who practice every day have a longer, more active life than those who don't, and their health potential increases dramatically.Tai Chi accumulates your energy instead of draining it, so you feel refreshed when you finish. The slow, dance-like speed of Tai Chi creates balance, flexibility and calmness. Tai Chi integrates your mind with your body using deep breathing and using mental imagery, and is very effective at relieving stress. Now you can learn Tai Chi from an international Tai Chi judge with 25 years teaching experience, taught such famous individuals as Francis Ford Coppola, Tom Cruise, Nicolas Cage, Patrick Swayze, Emilio Estevez, Ralph Macchio and many others. 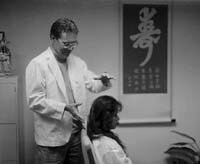 Combined with his background in acupuncture, Mark teaches 3 styles of Tai Chi exclusively from a health perspective. They include warm-ups that detoxify the body, postures that stimulate every gland and organ, and movements that loosen every joint in the body. Most forms of exercise dissipate your energy, leaving you tired and hyper at the same time! The slow, gentle, dance-like movements of Tai Chi accumulates energy while calming you down, allowing you to feel refreshed when you finish. Tai Chi creates an awareness of and influences dimensions of our being that are not part of traditional exercise programs. Most exercises do not involve the meridian system used in acupuncture nor do they emphasize the importance of adding mind intent and breathing techniques to physical movements. When these dimensions are added, the benefits of exercise increase exponentially. Many studies have shown Tai Chi to be extremely effective with slowing the effects of aging, increasing balance and reducing falls, reducing stress, minimizing the effects of diabetes and increasing the potential for preventing strokes and extending life. The fact that it is now encouraged by HMO’s and Kaiser Permanente (mostly due to public demand) shows its effectiveness. Another thing to consider is the fact that Tai Chi is practiced by over 80 million people daily! This makes Tai Chi the most popular form of exercise on Earth! It is part of the 4,000 year-old system of Traditional Chinese Medicine practiced in China and now recognized by the U.S. National Institute of Health's Office of Alternative Medicine as an important method of Alternative Health Care. Three quarters of the medical schools in the U.S.A. have included Complimentary Alternative Medicine programs in their basic curriculum and some have set up departments to incorporate Tai Chi into their research. The main conclusion from many studies is: Tai Chi helps the body heal itself. Another advantage is that Tai Chi is available to everyone, regardless of ability, age, belief system or life circumstances. Imagine this: 21st century-school children learning the health enhancement and self-healing techniques of Tai Chi as part of their PE class; office workers taking Tai Chi breaks, just as they do in China and Japan; seniors participating in gentle movement with breathing exercises to enhance balance and quality of life; care givers embracing a personal practice and finding renewal in their service to others; spiritual aspirants using Tai Chi to enhance their meditations and Tai Chi practice being instituted into prisons as a means to reconnect with life. Remember, society also benefits when an individual or a group of individuals assumes responsibility and takes action for their own health and healing. 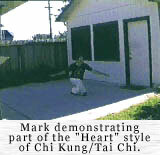 Almost every other Tai Chi DVD teaches Tai Chi as a form of martial art because Tai Chi traditionally is a martial art. With my background in acupuncture and Qigong, I left out all the unnecessary kicking and punching that is so common in most styles and have gathered together only the moves that are most conducive to self healing. By changing the intent of every move and modifying them slightly to enhance their healing potential, I have created a simple style considered by many in the field as being the most beneficial for health DVD on the market. Because I lead Tai Chi study tours to China and Tibet and have officiated in over 50 tournaments around the country over the past 12 years, I can honestly say: “I have seen it all”. And I assure you, I have integrated the most effective moves for self healing I could find over the 35 years I have been doing Qigong Tai Chi. We have sold over 600,000 copies so far and I get letters every day telling me how much they have benefited from my DVDs. Another great reason for buying my DVD is simply for its quality of reproduction. As a senior myself, as well as a healer and teacher for over 35 years, I know the importance of knowing the life enhancement and self-healing benefits of Tai Chi. I’ve made a commitment to sharing it with as many people as I can. Do You Have a Certification Program? Yes we do. If you live at a distance from our location in Santa Rosa, CA, you can Skype with me until I feel you have thoroughly understood and executed the moves of our style. At that point we send you a certificate from our lineage for $200 that allows you to teach our style — especially senior centers in your area. The NQA, of which Mark is one of the founders and is presently on the Advisory Council, is a great way to meet other Chi enthusiasts. If anyone is interested in joining this grass-roots, democratic association, call Ali: 888) 815-1893.